John G. Geer was recently interviewed for an NPR piece on mudslinging campaign ads. The piece was occasioned by a Republican National Committee television ad aimed at Tennessee senatorial candidate Harold Ford Jr., that, according to NPR, “is so loaded with innuendo that even Ford’s Republican opponent denounced it.” Geer says the ad in the Ford race “makes the Willie Horton ad look like child’s play,” but he stands by the thesis he developed in In Defense of Negativity: Attack Ads in Presidential Campaigns. “Negative ads are underappreciated, because they are actually much more substantive than positive ads. If you want more issues, the issues to be more specific, the issues to be documented, and the issues to be the important ones to the public, it turns out negative ads have that more than positive ads,” said Geer in the interview. 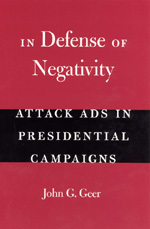 Geer’s timely, controversial take on political campaign techniques is featured in our 2006 Election Anthology, where you’ll find many books relevant to the midterm elections. . . .
Robert Pinsky’s weekly column for the Washington Post recently featured new work by Liam Rector from his book The Executive Director of the Fallen World. 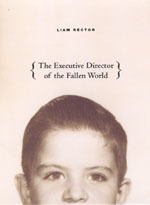 Pinsky writes: Liam Rector’s new book, The Executive Director of the Fallen World, expresses a stringent yet generous tone toward the profane, ignoble world of his title. Without necessarily forgiving himself or the rest of greedy and needy humanity, Rector chooses instead a dry, somewhat charitable acknowledgment that the world is… worldly. Pinsky chooses the poem “Twenty-Three” and gives it a short but approving treatment to back up this assessment of Rector’s work saying: Fatalistic about the behavior of groups, is resigned to the fallen nature of the individual. There’s a forgiving element, a sad shrug and smile, in the idea that the vulnerabilities, failings and dreams of our early 20’s persist, somewhere in us, for the rest of life. And though worldly, that notion… suggests the opposite of “disillusion”: The beautiful albeit deluded youth inside us endures, and keeps wanting the world. Pinsky’s review reprints the full text of “Twenty-Three.” . . . 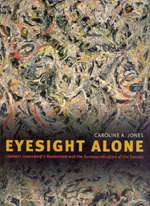 The October 16 issue of the Nation features a five-page article by Barry Schwabsky on the work of former Nation contributor Clement Greenberg—art critic, historian, and the central subject of Caroline Jones’ recent book Eyesight Alone: Clement Greenberg’s Modernism and the Bureaucratization of the Senses. The Nation article includes an interesting retrospective of the impact of Greenberg’s work on the world of contemporary art while hailing Jones’ book as the best critical history of Greenberg’s writing available, trumping several recent biographies. Schwabsky recommends: Readers who want a better understanding of what Greenberg wrote and why, and above all why what he wrote was so significant, would in any case be better off if they ignored biographies and did the harder but more rewarding work of reading Jones’ dense, indeed sometimes maddeningly verbose, “critical history.” Like Jones leans on biographical material … along with Greenberg’s own writings as well as reactions to and (and against) Greenberg by the art critics and historians that followed in his footsteps; but she brings to all this an analytical intensity, an almost ferocious determination to dig into the text, that makes the biographers’ declarative flatness seem dull by comparison. The hundred pages . . . Recent Republican victories have been attributed to the voting strength of the religious right. Popular rhetoric has it that by appealing to the faith-based values of conservative Christians, the Republican party has been able to ride moral issues such as abortion, gay marriage, and stem-cell research to political power and glory. According to the opinions of the punditry it is this ever-growing demographic of “values voters” that clinched George W. Bush’s win in 2004. 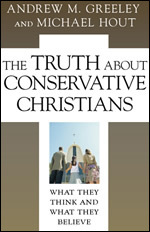 However, in their new book The Truth about Conservative Christians: What They Think and What They Believe authors Michael Greeley and Andrew Hout argue otherwise. An article in the October 21 Economist applauds Greeley and Hout for brilliantly deconstructing some of the myths about the conservative Christian electorate, and revealing the factors that truly motivate their political decisions. From the Economist: actually make up a third of the population. Common sense would suggest that they do not think alike. Now two academics have found data to support common sense. In a new study, The Truth about Conservative Christians, Andrew Greeley and Michael Hout, two sociologists, explode some cherished myths… The biggest myth of all is that conservative Christians are dyed-in-the-wool republicans. Mr. Bush certainly . 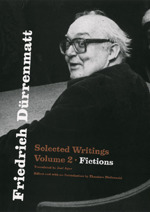 . .
Kenneth Anderson reviewed the three volumes of Selected Writings of Friedrich Dürrenmatt in the weekend edition of the Wall Street Journal. Anderson notes the unfamiliarity of Dürrenmatt to readers in the English-speaking world (with the possible exception of his tragi-comic play, The Visit). Nonetheless, writes Anderson, Dürrenmatt is a much more interesting writer than his thin English-language profile suggests. It is therefore a pleasure to welcome the University of Chicago Press’s three-volume collection of his writings—plays, fictions, and essays. 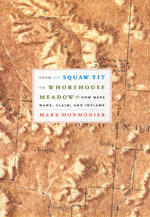 The volumes are splendidly translated by Joel Agee and severally edited and introduced by Kenneth J. Northcott, Brian Everson, and Theodore Ziolkowski. The introductions provide a solid grounding in Dürrenmatt’s work, and they help us to understand what it meant to be a German-language Swiss writer in the immediate postwar period. Anderson’s review goes on to compare the political neutrality to Swizerland with the “aesthetic neutrality” of Dürrenmatt’s writings. “Switzerland’s neutrality is certainly a blessing to the country’s citizen-beneficiaries,” writes Anderson, “but engaging with history may require an involvement that is a bit, well, less neutral.” In America, of course, we have no truck with neutrality. All the more reason to take seriously—that is, to think seriously about—approximately three volumes worth . . . The October 23 issue of the New Yorker has a fascinating review by Anthony Grafton of William Clark’s Academic Charisma and the Origins of the Research University: Clark thinks that the modern university, with its passion for research, prominent professors, and, yes, black crêpe, took shape in Germany in the eighteenth and nineteenth centuries. And he makes his case with analytic shrewdness, an exuberant love of archival anecdote, and a wry sense of humor. It’s hard to resist a writer who begins by noting, “Befitting the subject, this is an odd book.” It’s also hard to resist Grafton’s review when it’s titled “The Nutty Professors” and asks some perfectly sensible questions: Why, in the age of the World Wide Web, do professors still stand at podiums and blather for fifty minutes at unruly mobs of students, their lowered baseball caps imperfectly concealing the sleep buds that rim their eyes? Why do professors and students put on polyester gowns and funny hats and march, once a year, in the uncertain glory of the late spring? Why indeed? Clark shows how the university developed in response to market forces and the intrusiveness of the state bureaucracy, and established itself as a self-regulating . . .
On November 9, 2006, Stewart Brand, founder of the Whole Earth Catalog, will join panelists Kevin Kelly, Howard Rheingold, and Fred Turner at Stanford University’s Cubberley Auditorium to discuss the “extraordinary impact of the Whole Earth Catalog and American counterculture on contemporary computing and everyday life.” Turner, author of the recent book From Counterculture to Cyberculture: Stewart Brand, the Whole Earth Catalog, and the Rise of Digital Utopianism, will moderate the panel discussion from 7:00 to 8:30 pm to be followed by a public reception with the panelists. More info on the symposium is available at Stanford’s Web site. 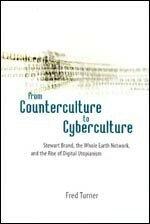 Stewart Brand and the Whole Earth Network formed a group of artists and entrepreneurs who worked to bring together the disparate worlds of high technology and back-to-the-earth hippies of the ’60s and ’70s. Through their innovative adaptation of modern technologies they transformed the instruments of the military-industrial complex into tools with which to forge the new, positive, sustainable culture envisioned by the radical social movements they they embraced. Between 1968 and 1998, via such familiar venues as the National Book Award–winning Whole Earth Catalog, the computer conferencing system known as the WELL, and, ultimately, the launch of the wildly successful Wired . . .
A recent review in Booklist gives a thumbs-up to Roger Ebert’s new book, Awake in the Dark: Forty Years of Reviews, Essays, and Interviews: Ebert, probably the most prolific film critic of all time, here distills his massive life’s work into a single volume. After a nostalgic introduction recounting his initial forays into criticism, he presents reviews of the best films of each of the last 38 years, from Bonnie and Clyde to Crash, and a selection of foreign films, documentaries, and ‘overlooked and underrated’ works. More compelling are longer ‘think pieces’ on such topics as colorization, the movie ratings system, digital projection, and Star Wars’ deleterious effect on Hollywood. Those, and a selection of star profiles and interviews, allow him to share his expertise and voice his passion in a fashion that daily reviewing seldom permits. You can see previews of Awake in the Dark on Ebert’s own Web site, which this month features some of the reviews, interviews, and other pieces from the book. Excerpts from the book are also being featured in the movie section of the Sunday edition of the Chicago Sun-Times. Ebert continues to recover from a recent surgery, but will return to writing reviews . 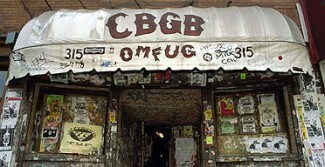 . .
CBGB, the legendary New York night club that spawned some of the most colorful icons of the punk genre—Patti Smith, Blondie, the Ramones—closed last Sunday, the end of an era in American music. Though the music may no longer be as loud as it was during the club’s heyday in the mid-seventies, the powerful influence of the club and the culture that surrounded it continues to permeate nearly every form of popular music today; even the more sophisticated echelons of the avant-garde. A listen to the hipster stylings of contemporary chamber musicians the Kronos Quartet is enough to demonstrate the profound ways that the world of modern art has enthusiastically assimilated the forms and conventions of punk rock. The collision between low-brow pop artists and the artistic avant-garde was the subject of Bernard Gendron’s 2002 book Between Montmartre and the Mudd Club: Popular Music and the Avant-Garde. When we published Gendron’s book we posted an excerpt to our Web site focused on the first wave of punk that crested on CBGB’s dilapidated stage. The excerpt is an excellent introduction to the early history of CBGB, bands like the Ramones and Talking Heads, and the pop and/or art sensibilities that echoed . . .